Les Chefs de France is located in the France Pavilion in Epcot. Themed after a Parisian brasserie it is elegant with white linen table cloths and large windows that look out to the theme park. Les Chefs is a restaurant that we have come to enjoy as an escape from the hustle and bustle of the park. We first dined at here in 2003 for our honeymoon and haven’t skipped it since. Our reservation was for noon and we were seated within less than 5 minutes. As we entered the dining room we were seated at a lovely table by the windows. Within moments our server Farid greeted us. We ordered 2 cups of coffee knowing that today was going to be a long day with “Mickey’s No So Scary Halloween Party” later that night. Normally I would order the Lobster Bisque because it’s my favorite soup and Les Chefs has one of the best. However today I decided to try something new and went with the crepe which was stuffed with cheese and chicken. My husband ordered the Mushroom Tart, similar to a mini pizza with wild mushrooms and four cheeses. It was very delicious and could have been a meal. 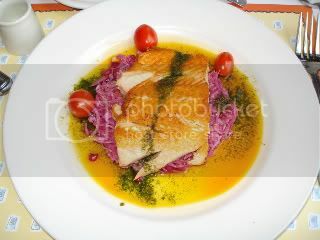 For my entrée I went with the broiled salmon served over an apple cabbage topped with a fresh herb vinaigrette. The salmon was wonderful, light and flakey. 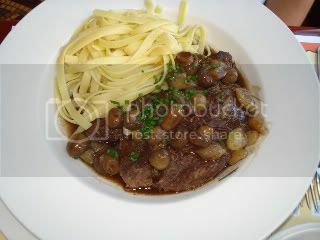 We also had the braised beef short ribs with a Cabernet sauce, pearl onions and mushroom served with linguini pasta. This was the better of the two dishes. The short ribs were so tender and juicy. The Cabernet sauce was what made the dish elegant. Instead of going with your typical dessert I decided to have the imported cheese plate. It was wonderful! I could have had a second one. He on the other hand went with Farid’s suggestion and ordered the chocolate tarte. It was very chocolaty but good. As always Les Chefs de France lived up to my expectations, a wonderful atmosphere, good food and great service.